An old story tells how Easthampstead Park was the site of an early palace of the Saxon Kings of Wessex and here King Oswald of Northumbria met King Cynegils of Wessex to negotiate for his daughter's hand. There is no evidence to support this, but the place had certainly been in Royal hands from time immemorial. It was never the manor house of Easthampstead (which belonged to Westminster Abbey until the Dissolution), but was one of the several Royal hunting lodges dispersed across Windsor Forest. It seems to have been in existance by the 1320s, a moated building located just north of Old Oak Farm, in the middle of the present golf course. It became popular with Edward III's hunting parties out of Windsor Castle and, by 1365, he had had an area of 265 acres surrounding it emparked and stocked with 300 fallow deer for the chase. It became the centre of 'Easthampstead Walke' - one of the official Forest divisions. The lodge was, however, a particular favourite of Edward's grandson, Richard II, as shown by the many Royal decrees he signed there. Further stories tell how King Henry VII took his son, Prince Arthur, out hunting from Easthampstead to see his future bride, Catharine of Aragon, for the first time on Finchampstead Ridges. When his other son, and this lady's second husband, Henry VIII, grew tired of her, Queen Catherine was banished from the Royal Court and spent her days moving between minor Royal properties, including Easthampstead Park. It is said that she received the Royal commissioners there. They pleaded with her to agree to having divorce proceedings heard in England; but she would have none of it. Some say she was even staying there when she heard that the divorce had been finalized. The diplomat, Sir John Mason, became the Keeper in 1548 but his foreign missions no doubt kept him away from Easthampstead. King James I was the last monarch to use the lodge. At this time the lodge was a triple-winged building laid out around a quadrangular courtyard facing north-east. It may have been 15th century in date. Two driveways approached the house, crossing over twin drawbridges and through gatehouses on the north and east sides of the moat. The King enlarged the park, but, in 1629, his son, Charles I, granted Easthampstead and its rights of the chase to his keeper, the aging former ambassador, William Trumbull, in recognition of his own diplomatic services. Trumbull apparently had the old Royal lodge encased in a fine new east-facing Jacobean mansion (the style of the present Victorian house), perhaps the one which is known to have been designed by Edward Carter. He retained the old moat, but demolished the gatehouses and diverted the northern approach. A lime kiln used to make mortar for the new building's construction has been excavated beneath Jennett's Park, which originally lay within the estate boundaries. Only the old stable block survives from this building complex: the low white copula-adorned brick building adjoining the golf course. Trumbull probably also introduced much of the landscaping: two lakes, one of which still survives on the golf course, and a walled garden now beneath Easthampstead Park School. His son, William Trumbull II, inherited Easthampstead six years later. He was a Clerk of the Signet, granting appointments from the Patent Office. When the Civil War began in 1642, he sided with Parliament and thus probably saved Easthampstead from destruction, although poachers and passing soldiers do seem to have eaten all the deer in the park! His son, Sir William Trumbull, restored the family fortunes however. He was a man of letters who travelled extensively on the Continent in his youth with men like Sir Christopher Wren. A barrister by profession, he gained a number of positions at Court, often serving overseas, such as in Constantinople. He eventually rose to be Secretary of State, but retired from public life to Easthampstead in 1698. The cream of literary society then flocked to the park. Trumbull encouraged John Dryden to translate Virgil's Aeneid and Alexander Pope to translate Homer's Iliad. He became great friends with the latter, who lived not far away, at Binfield. Trumbull even appointed the poet, Elijah Fenton, as his son's tutor. This fourth William Trumbull chose to live the life of a country gentleman when he inherited Easthampstead in 1716. He had only one child, Mary, the wife of Col. the Hon. Martin Sandys (7th son of Samuel, 1st Baron Sandys of Ombersley), whose only child, and the heiress of both families, was Mary, the wife of Arthur Hill, 2nd Marquis of Downshire. Easthampstead Park - described as 'the jewel of Mary's inheritance' - became their chief English estate and the parish church the family's mausoleum. The couple may have updated the interior of the mansion since a number of 18th century fireplaces from the old house survive in the present building. However, the Downshires also owned vast estates - over 23 times the size of the Easthampstead Park - in Ireland and resided mostly at Hillsborough Castle. It was the 3rd Marquis who first recognised the the importance of the famous 'Trumbull Manuscripts': personal, estate and diplomatic papers and correspondence, mostly relating to his great great grandfather and long kept at the house. He was the first person to catalogue the 380 volumes. Although removed from Easthampstead in the 1940s, the manuscripts were nearly sold by teh family for £2.5m to pay death duties in 1989. However, the Inland Revenue managed to negotiate a deal and they now reside in the Berkshire Record Office. By 1860, the Jacobean mansion at Easthampstead had become quite run down and the 4th marquis decided to demolish it and rebuild anew. The present house which was completed in 1864. The building is in Jacobean style with curved gables, pierced stone parapet and stone frontispiece of naive classicism. The garden wall to the south-west and the early eighteenth century wrought iron gate are also listed. An attractive feature of the house is the large window by the main staircase, in which are portrayed the coats of arms of the Downshire family and their ancestors. In February 1856, the foundation stone of West Gardens House was laid by Lady Alice Maria Hill, aunt of the sixth marquis. At about the same time as the present mansion was erected, the Marchioness provided for the rebuilding of Easthampstead Parish Church (St. Michael's) where there are memorials to the Trumbull and Downshire families, and to the poet, Fenton. For centuries the people of Easthampstead Park crossed the fields to the village church, whose tower can be seen from parts of the Park above the roofs of the Great Hollands neighbourhood of Bracknell New Town. The Downshires were very active in the affairs of Ireland, but the sixth marquis lived principally at Easthampstead Park, dying in 1918. His were the great days of Easthampstead Park, especially during Ascot week each year. The sixth marquis and his son employed a large staff of gardeners and others, and look great personal interest in the estate, even to the point of assisting with the upkeep of the roads with their own steam roller. The Park also contained a miniature steam railway, since removed to a south coast resort. 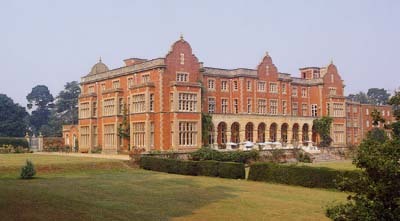 During the Second World War, part of the Mansion was used by St. Paul's School, which was evacuated from London to Wellington College, Crowthorne. The Army made use of the Park, and built many Nissen huts. Some of the concrete road blocks made by the Army, and the concrete bases of huts, are still to be seen. The Army's presence in 1941 attracted German aircraft which dropped a stick of bombs down the main drive, the last one hitting the lodge at the main gate and damaging it without exploding. After the War, Easthampstead Park was sold to the Berkshire County Council. One night a great fire destroyed the gabled roof. After repairs, a training college for teachers was opened and the mansion was altered and extended. Today it is a thriving conference centre. Easthampstead Park is now a conference centre.